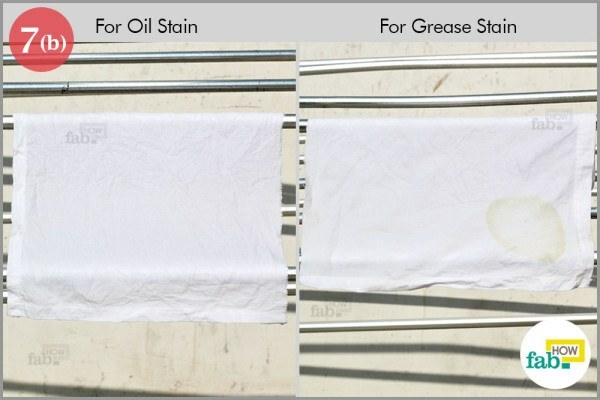 Oil and grease stains in clothes are as ubiquitous as clothing itself. If your favorite clothing has not yet been ruined by a stain, then count yourself among the chosen few, although that must not stop you from being prepared. 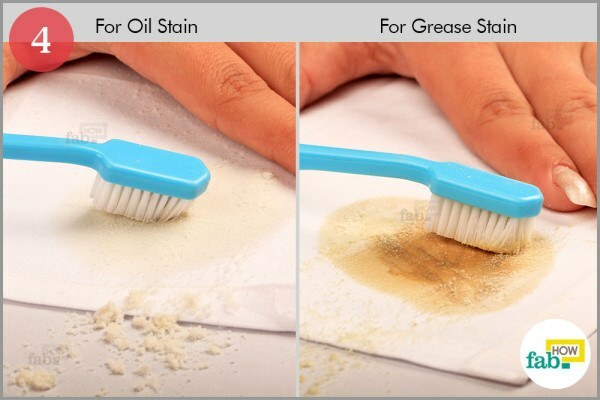 If you are already a victim of oil and grease stains, then gear up for retribution. 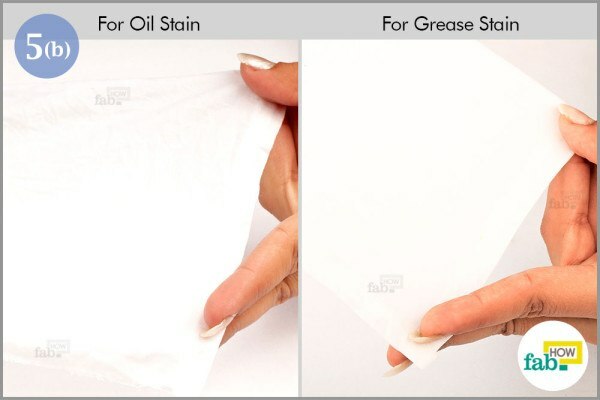 Here are a couple of tricks to remove oil and grease stains from your favorite clothing. All you need are some household products and you’ll astonish your friends with resourcefulness akin to Walter White in “Breaking Bad”. 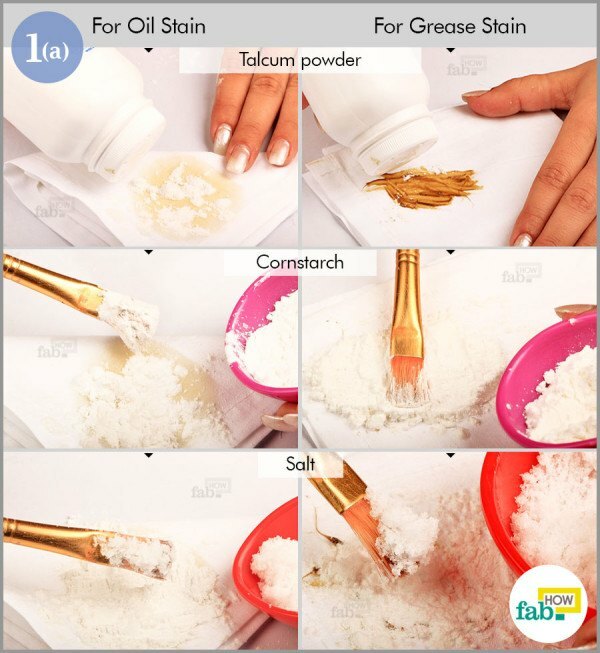 Sprinkle talcum powder, cornstarch and salt on both the stains. 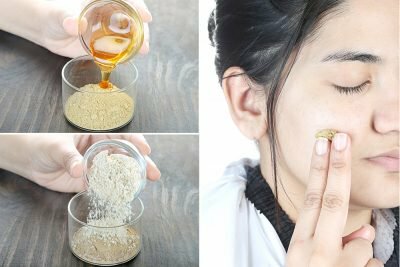 Use a soft brush to mix them thoroughly. 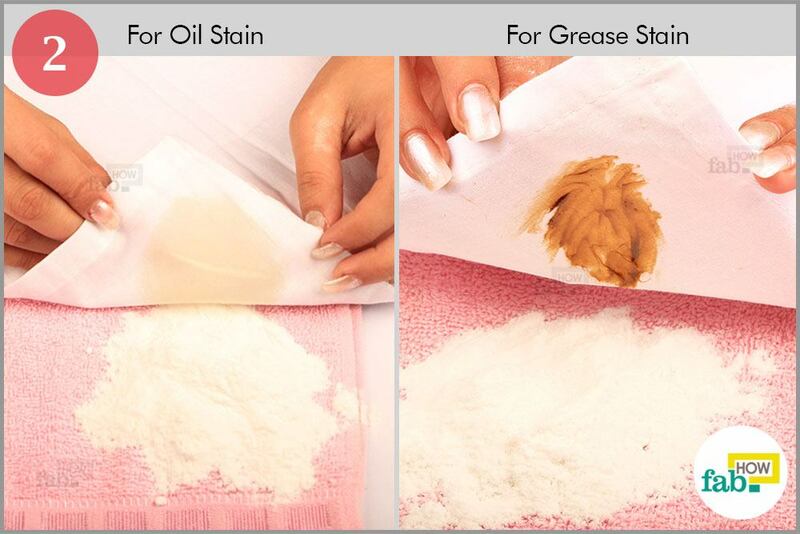 Spread the mixture uniformly over the stains. Let it sit for 1 hour to allow the fine particles of powder and starch to settle into the crevices of the fabric and pull out the stains. 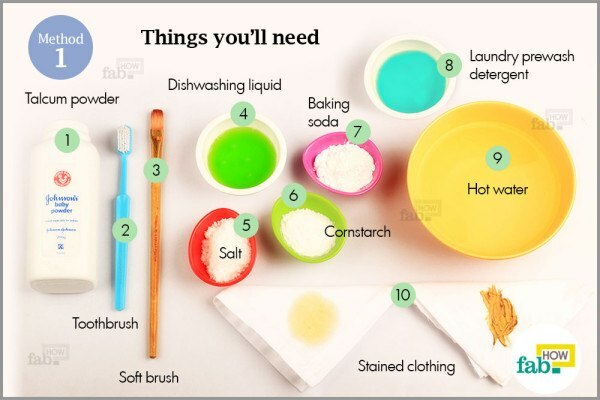 Brush the mixture off the clothing using a soft brush. You will see that the stain has already begun to fade. 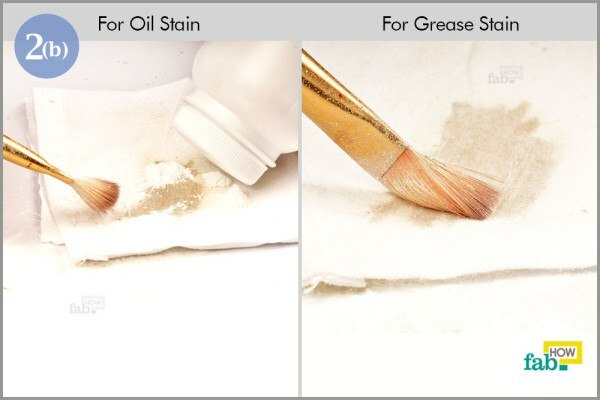 Repeat steps 1 and 2 until you see the stain is significantly fainter than originally or the maximum amount of oil or grease has been absorbed. 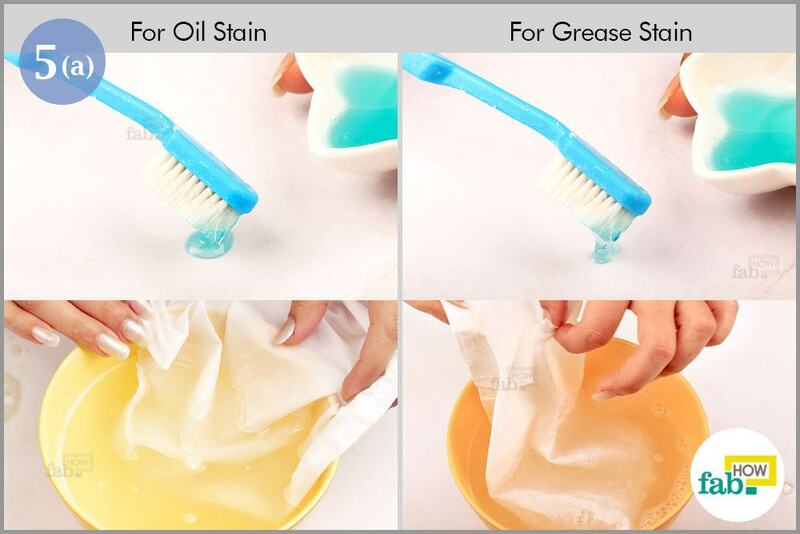 Use a soft toothbrush to gently rub dishwashing liquid on the stain. After applying, let it sit for 5 minutes. Now, soak the stain in hot water for about 30 minutes, then wash it under warm running water. Note: If the stain still persists, apply a paste of 3 parts baking soda and 1 part water and brush it off. In the above example, the oil stain was easily removed so the paste was applied only to the grease stain. 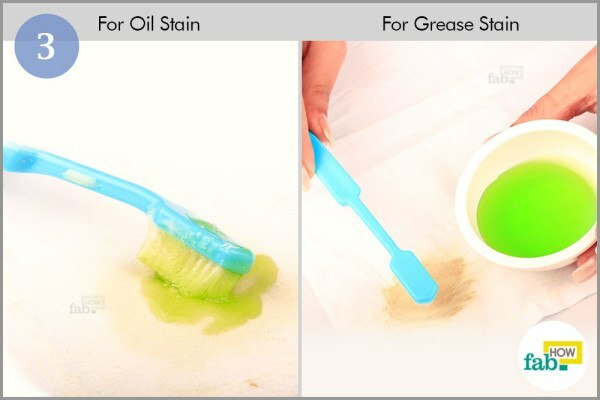 You can use it on an oil stain too, if it is severe. 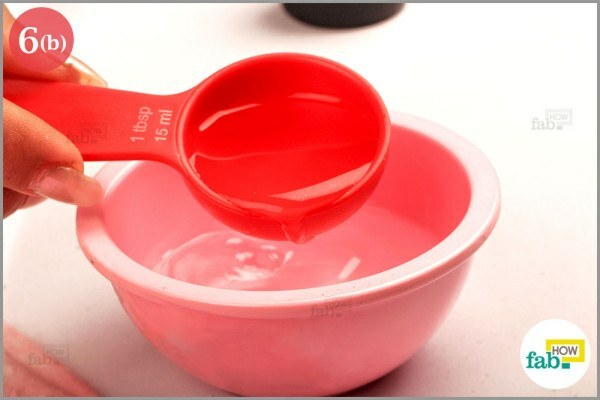 Use a soft toothbrush to dab on a little liquid prewash laundry detergent. Then wash the clothing with warm water and check that the stain is completely gone. Dry it under the sun for 3 to 4 hours. 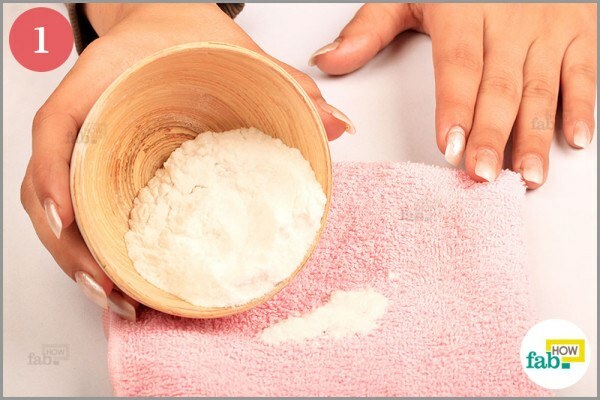 Sprinkle baking soda onto a light-colored towel. 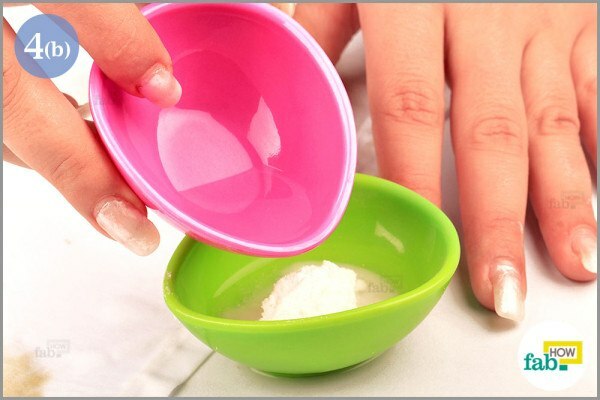 Do not skimp on the quantity of baking soda. The amount must be enough to make a small mound that will cover the stain completely. Now place the stained clothing over the mound of baking soda, with the stain facing the soda. Set the temperature of the iron according to the type of fabric (silk, cotton, polyester, etc.). 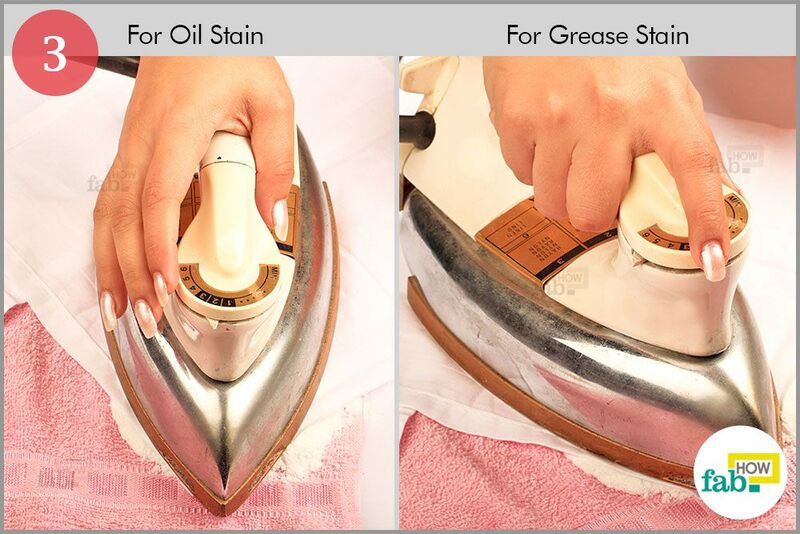 Use a steam iron for the ironing method. If you don’t have a steam iron, sprinkle some water on the fabric and then iron it. When the iron is warm, press the stained clothing. You will notice a prominent fizzing or sparkling sound as you iron. 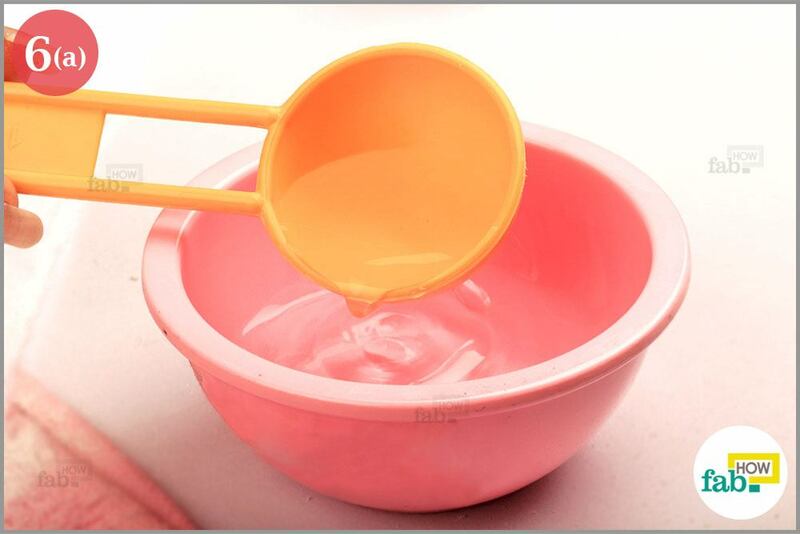 It is the baking soda reacting with the oil in the presence of heat and moisture. If you can hear the sound, it means the method is working. Repeat steps 1 through 3 with a fresh towel until the stain has faded significantly. Use a soft toothbrush to rub baking soda directly into the stain. 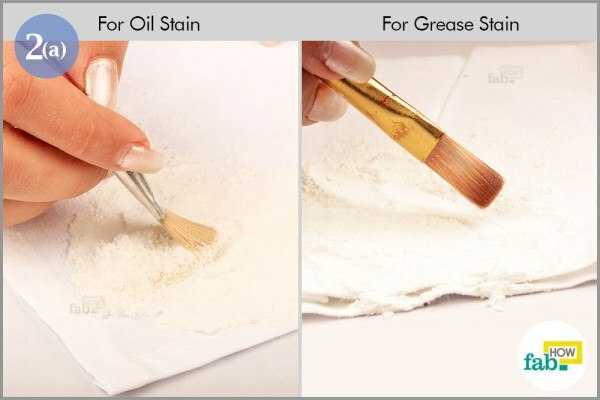 Keep applying and rubbing the baking soda until the stain fades away. If the stain is gone completely, wash the fabric with warm water. If the stain persists, proceed to the next step. 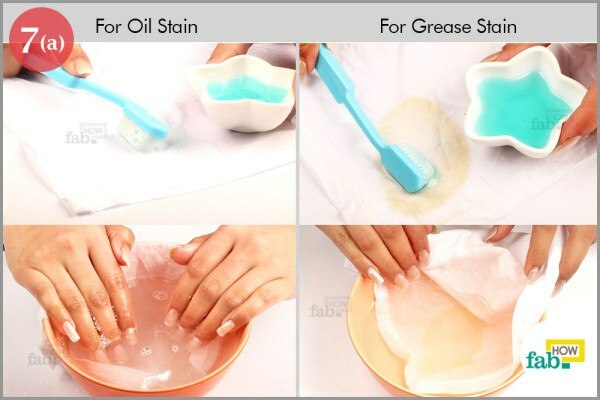 If the above steps do not remove the stain completely, use a dishwashing liquid. 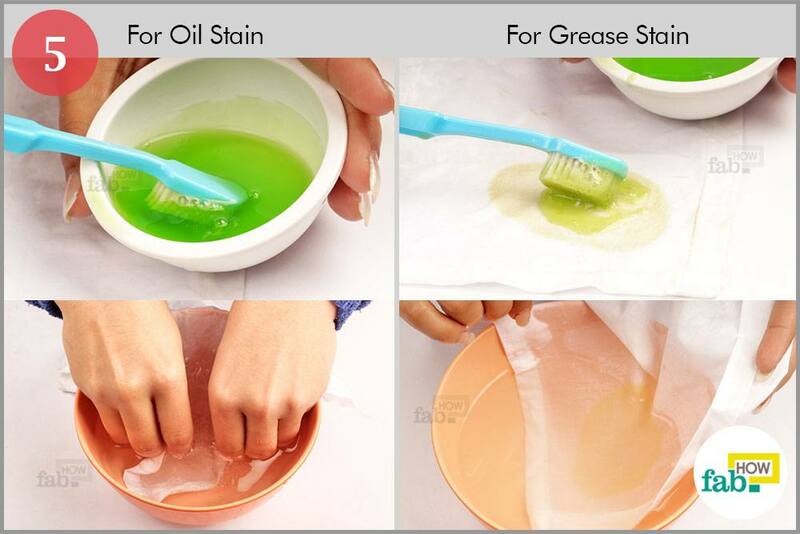 Apply it thoroughly on the stain and rub it with a soft toothbrush. Rinse it off in warm water. Mix equal quantities (about 2 tablespoons) of vinegar and water in a bowl. Now apply this mixture on the stain and let it sit for a couple of minutes. 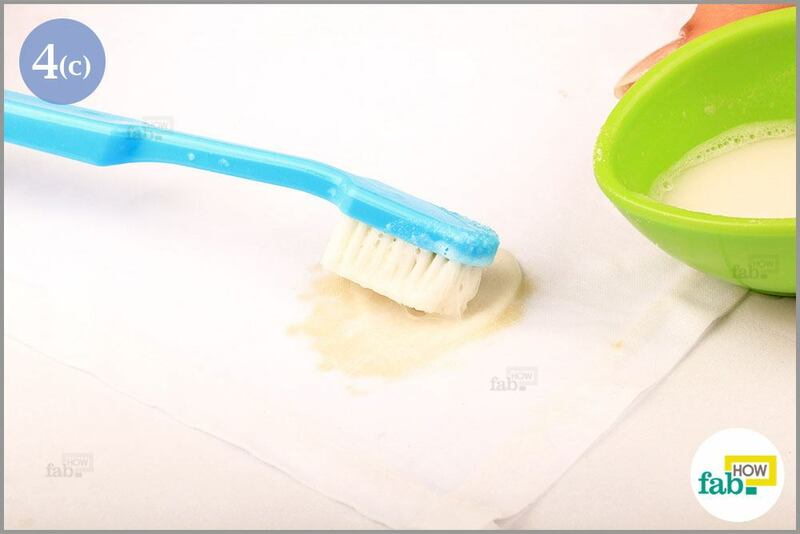 Rub the stain with a soft toothbrush dipped in the vinegar and water mixture. For the final wash, apply liquid laundry detergent with a toothbrush. Rub it thoroughly into the stain and wash the clothing in water. Keep repeating the above process until the stain fades away. Rinse the clothing and dry it under the sun for 3 to 4 hours. 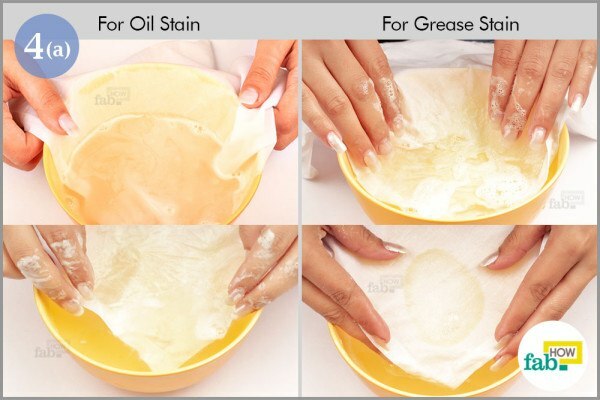 Note: This method is not as effective in removing the grease stain as the previous method (It is possible, that not using a steam iron might have caused this, but it cannot be established conclusively). 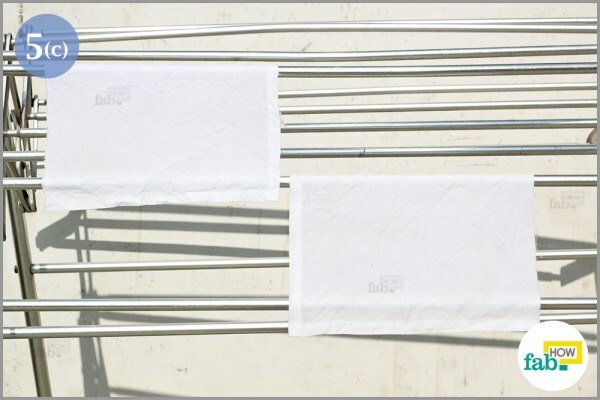 Do not use baking soda on delicate fabrics. A soft brush is essential or you may damage the fabric while rubbing it hard. 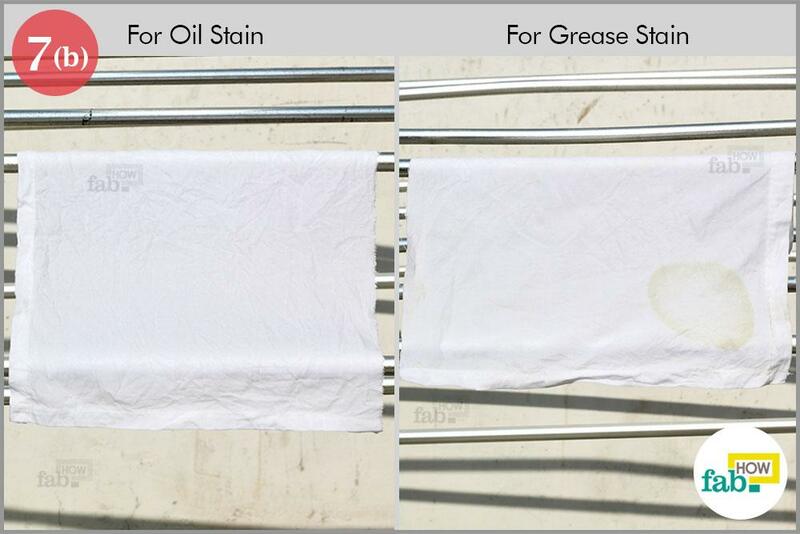 With successive washes by a mild detergent, the stain finally fades away. 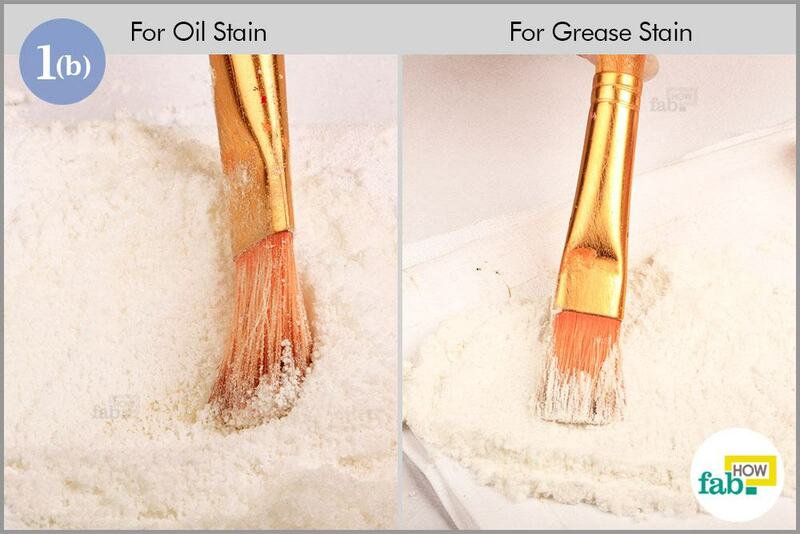 To remove oil and grease stains timing is essential. 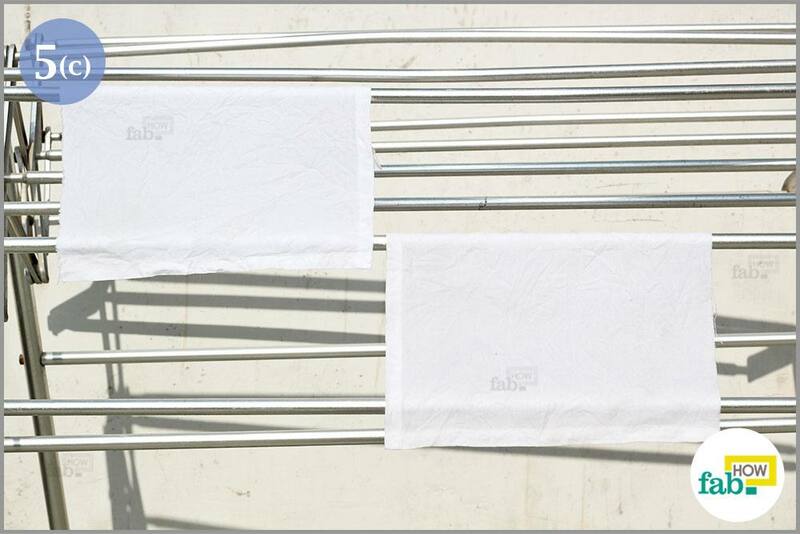 The sooner you wash the fabric, the better your chances of getting rid of the stain. 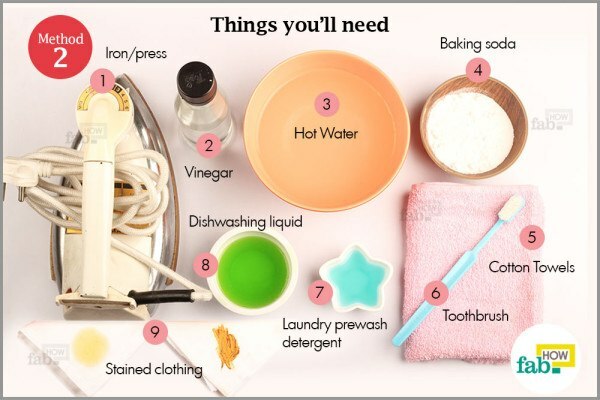 Use a steam iron for the ironing method. If you don’t have a steam iron, sprinkle some water on the fabric and then iron it. I have to say that the first method indeed worked. I have a white hoodie in where I ate a greasy food and a various stains appeared but after trying method 1 it seems that those stains are long gone now. It actually came out like new!